Once again, the leftist thugs of Central America test our mettle and prove the impotence of international organizations. Costa Rica says that last week Nicaraguan troops entered its territory along the San Juan River - the border between the two nations. 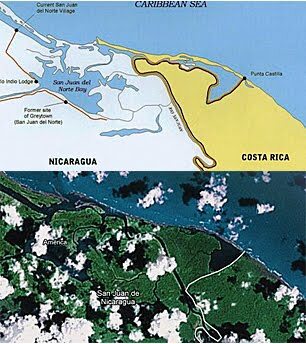 Nicaragua had been conducting channel deepening work on the river when the incident occurred. The Panamanian economy and Panamanian stability would be in real danger of collapse if another canal took away its monopoly on shipping between the Atlantic and Pacific oceans. Nicaragua has refused the OAS request that it pull its troops back. Both capitals are accusing the other of "provocations," but it is evident that the neo-Sandinista regime is moving more military and construction equipment into the disputed river region. This week, San Jose's Minister of Public Security, Jose Maria Tijerino, announced that the Costa Rican National Police seized six military trucks that were shipped from Germany and bound for Nicaragua. The vehicles landed at the port of Limón as Nicaragua does not have suitable ports on its Caribbean coast. Later, after meeting with President Chinchilla's Security Council, Tijerino revealed that the trucks would be permitted to proceed to their destination. "This serves as an example we are [a] state of rights and are not at war with Nicaragua," explained Tijerino. Although the military trucks seized by the Costa Ricans apparently originated in Germany, geopolitical analysts should prepare for the possibility that Russia will at some point begin shipping military hardware to its old Central American client state. Since KGB asset Ortega returned to power four years ago, Moscow has pledged to upgrade Nicaragua's Soviet-vintage armed forces. Indeed, earlier this month, Nicaragua's ambassador to the Russian Federation, Luis Alberto Molina Quadra, attended a session of the Russian-Nicaraguan Intergovernmental Commission on Trade, Economic, Scientific, and Technical Cooperation. The commission held its first "post"-Cold War meeting in Managua last June. How convenient would it be to Iran and Russia to be able to move shipments from one ocean to another so close to our border without having to fear inspections for weapons and contraband?